From the Two of Bows yesterday, to the Page of Bows today, the theme of being passionate carries onwards and forwards. Like children, the stoat is playful, inquisitive, quick, good at observing, keeping secrets, they’re extraordinary and a free spirit. What is extraordinary is that somehow, I’ve managed to stay married for ten years this very day! Though being playful and using the other qualities the stoat displays over the last ten years, we’ve made it this far. I hope that we enjoy the next ten years with just as much fun as over the last ten. 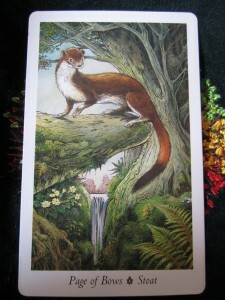 Stoats live in strong family groups, they’re also emissaries, messengers. Do you have a message to deliver today?? 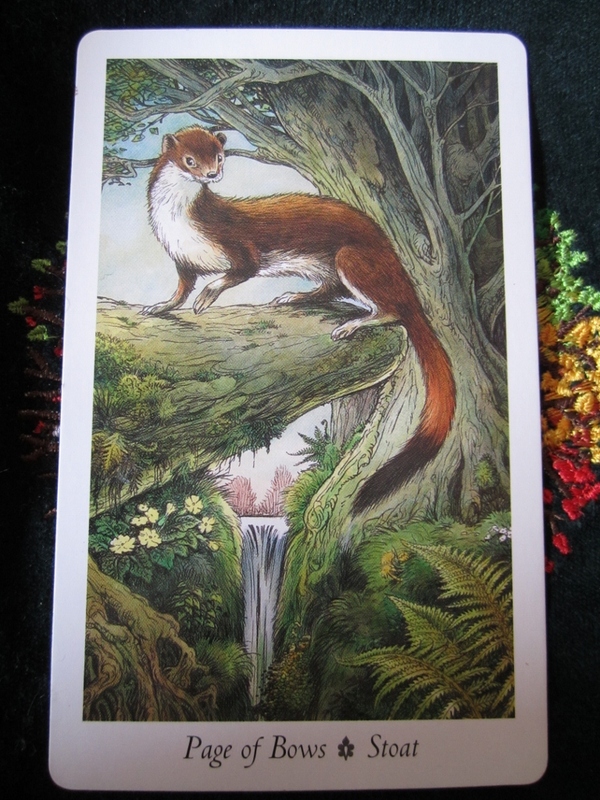 There’s a lot going on with the Stoat, as there is with any marriage, friendship and relationships, there are lots of layers and intricacies that are at play most of the time. So, what else does the Stoat have to offer us today? I would love to hear what else you find out about this fella today, he’s interesting!